It is not too late to start thinking Spring! As per Mr. Phil, we all know we have 6 more weeks of winter, but we also have been experiencing warmer temperatures! With that being said, now is a decent time to get a jump start on your spring pruning. It is a good thing to take care of ornamental fruit and flowering trees as well as some evergreens. The deadwood can weigh down a tree and this can lead to stress on the branches as well as the main trunk. The trees use their energy trying to support this dead wood instead of promoting new healthy growth. Spring is the perfect time to get your landscape ready for the upcoming season! 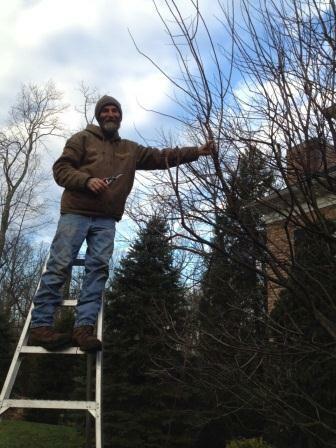 Removing dead branches and stems is a fantastic way to help your trees and shrubs push out healthy growth. You will see bigger fuller blooms on your flowering shrubs, and an overall healthier appearance. It is just like getting a hair cut! Remember that Spring is also a great time to ‘condition’ your plants by giving them the proper fertilizer so your plants can get all the healthy nutrition they need! When we take care of our yard, our gardens and our trees, we are not only impacting our properties but also the environment! Trees give us the oxygen we need to breath, so lets make them as healthy as we can!